SpeakerCraft AIM Series 2 has been completely re-crafted to support sophisticated installations, demanding sonic performance, and advanced object-based surround audio platforms such as Dolby Atmos(R), Auro-3D(R), and DTS:X(R). The re-crafting effort addresses every aspect of the speaker, from front to back, resulting in a sound solution you'll have to hear to believe. The Speakercraft AIM Series 2 breaks new ground by adapting technology that was once only utilized in large sound reinforcement experiences. By incorporating multiple tweeters in a line array, AIM Series 2 delivers focused high frequencies farther into the listening area than standard tweeter configurations so that listeners may enjoy a larger sweet spot. Complementing the ARC Tweeter Array is our updated WavePlane technology that acts as an acoustic lens, focusing the high frequency audio energy into the listening environment for a cleaner, wider, and richer sound. Front-Mounted Switches Allow for up to +/- 3dB of treble and dialog adjustment. Sensitivity: 88db 1W/1m. Maximum SPL: 110dB. Power Handling: 175 Watts. Impedance: 8 Ohm Nominal. Frequency Response: 35Hz-20kHz. Diameter x Depth: 11 1/16" x 6" (280mm x 152mm). Cut-Out Diameter: 9 7/8" (214mm). Factory sealed, white grill included, full manufacturer's warranty. 15 degree pivoting 8" aluminum cone woofer. 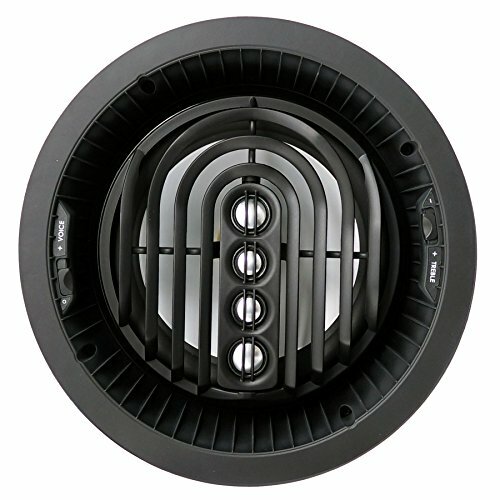 15 degree Pivoting 359 degree rotational ARC tweeter array with two 3/4" and two 5/8" aluminum dome tweeters. WavePlane technology with vortex eliminators. Acoustic Isolation Technology to minimize acoustic energy transfer to mounting surfaces. Flangeless appearance with magnetically attached white low profile grill. If you have any questions about this product by SpeakerCraft, contact us by completing and submitting the form below. If you are looking for a specif part number, please include it with your message.